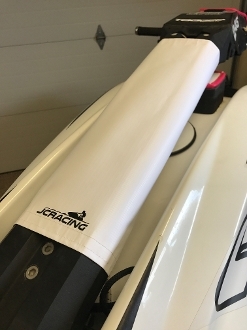 Now you can put your registration numbers and tags on a removable wrap that won’t clutter your ski! These handlepole wraps are adjustable to fit the RRP or the Ultra handlepoles. Simply wrap it around your RRP or Ultra handlepole, velco and go ride. Available in Black or White Vinyl and includes your custom registration numbers. Packaged and shipped in a reusable tube to easily store your wrap in your trailer box. Note: This design will not fit the stock handlepoles. Disclaimer: Due to some state specific regulations, locating the registration numbers on the handlepole may or may not be legal. Any registration numbers that are supplied by JCRACING may not be to some states size requirements. Usage of this product is the sole responsibility of the user, and by purchasing this product, you are agreeing that JCRACING is not responsible for any lawful wrongdoing. JCRACING will not pay, reimburse, or otherwise condone any unlawful acts that involve this product.